East Villagers are accustomed to crusties congregating outside empty storefronts, but sometimes those congregating are filmmakers! 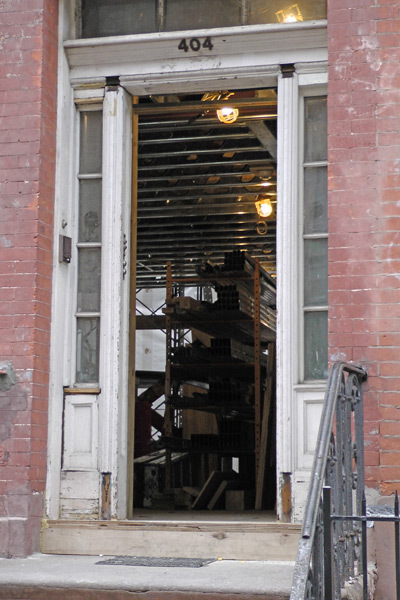 There's nothing like an abandoned storefront to add East Village character to a movie! 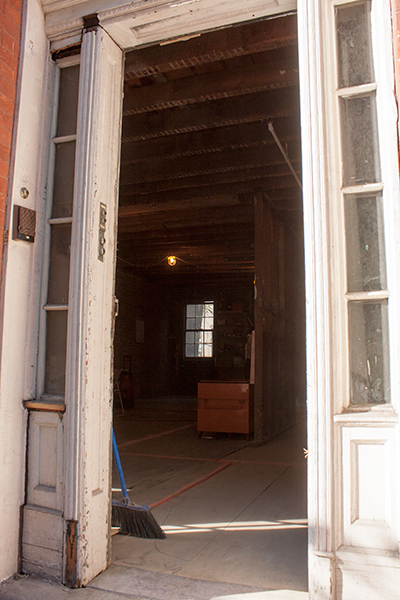 It's been a while since I've written about the Former-East-9th-Street-West-Virginia Building — that's because there's been nothing to say about it! 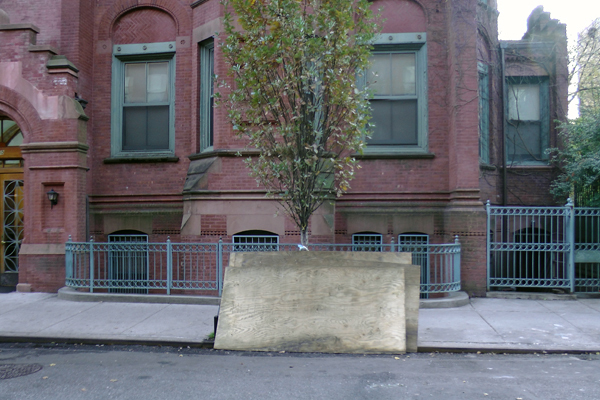 The more things change, the more they're not the same… in the East Village Today! Newest addition to the Mosaic Trail. It's difficult to know at this time whether this is by Mosaic Man Jim Power, a recent work by the famous Invader, or a new mosaic artist, but one thing is certain: It's a welcome addition to the beloved Mosaic Trail! Back in early November, I wrote about how East Villagers like to reminisce about the bad old days. 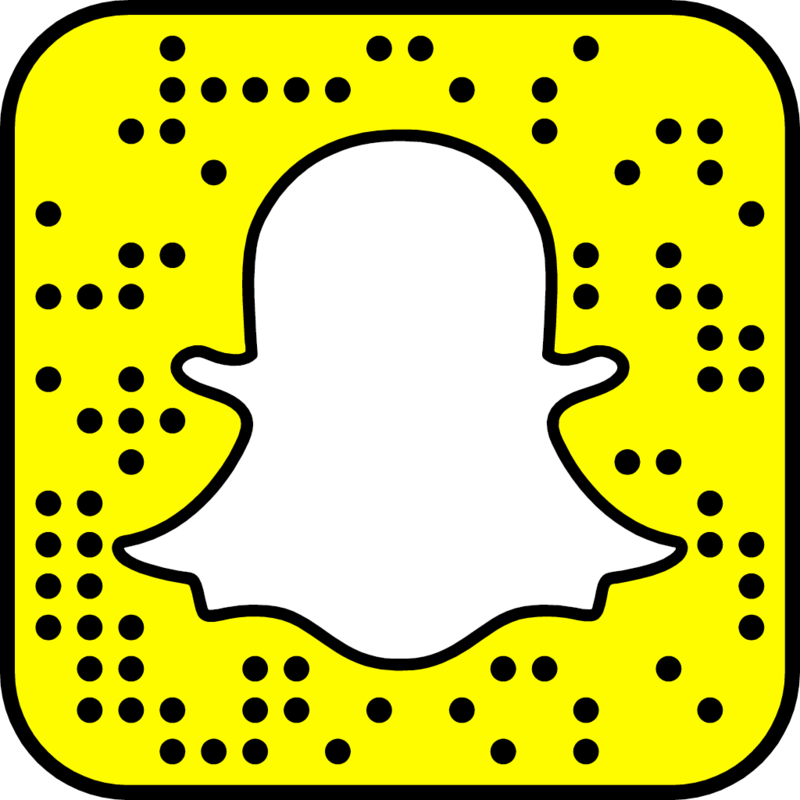 Updated for the 21st century. East Villagers love smiley faces! The beloved Dallas BBQ, that is! 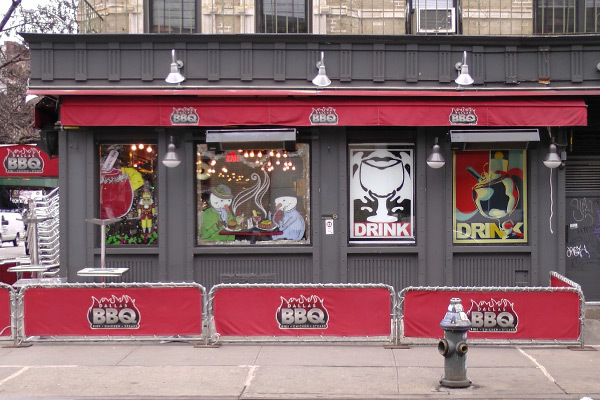 Dallas BBQ, on Second Avenue and St. Mark's Place. 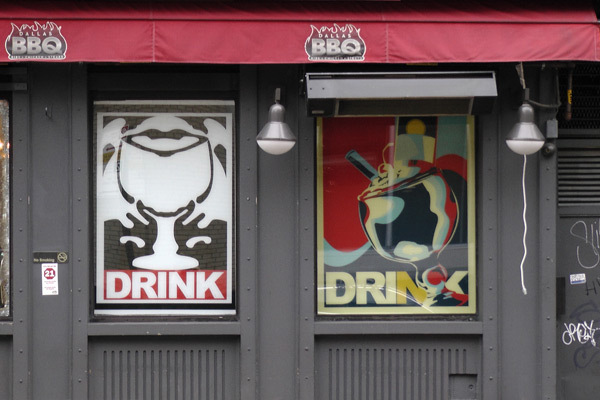 Close-up of the Shepard Fairey original Drink signs. 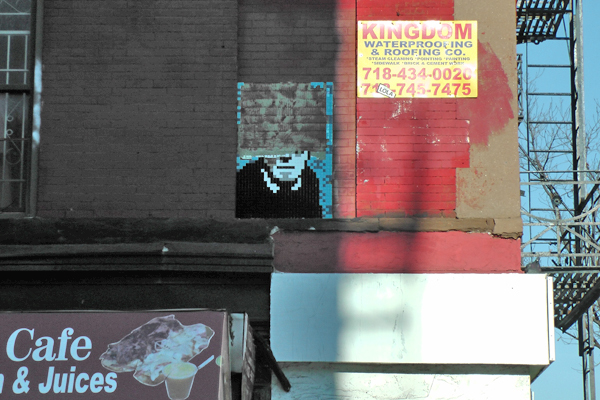 East Villagers love Shepard Fairey! 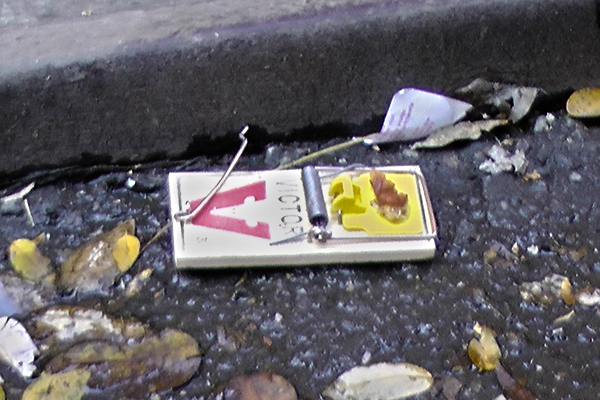 You gotta get up pretty early in the morning to catch an East Village mouse! East Villagers love jokes — and they love spaghetti! So what could be better than a restaurant where you can have both?! 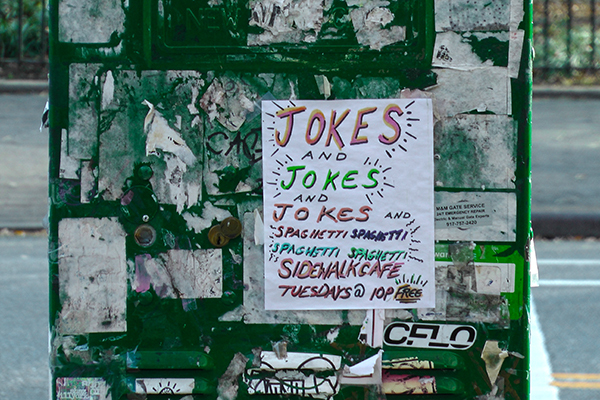 Yes, you can have both jokes and spaghetti at the beloved Sidewalk Cafe, just two blocks away, on East 6th Street, Tuesday nights at 10pm! And best of all, it's free! You can't beat that with a stick! 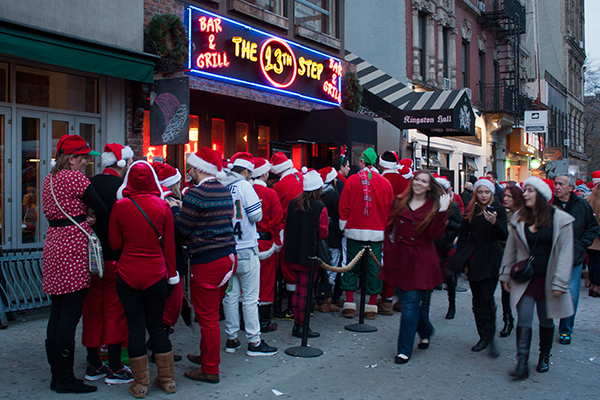 It seems like almost yesterday that SantaCon 2015 was here, and already East Villagers are preparing for SantaCon 2016! East Villagers are all exiles from somewhere, some place where their idiosyncrasies just didn't fit in with the syncrasies of the rest of the people of their town. Understanding this, someone has seen fit to open a gym to exploit that lack of belonging! 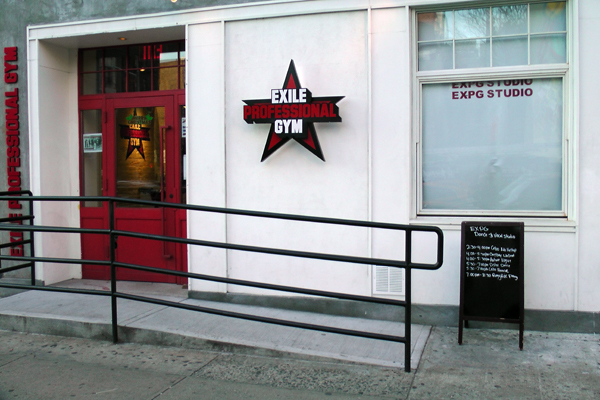 The gym for professional exiles. No need to feel isolated any longer, exiled East Villagers — soon you will be crunching those abs just like John Cena! East Villagers love John Cena! 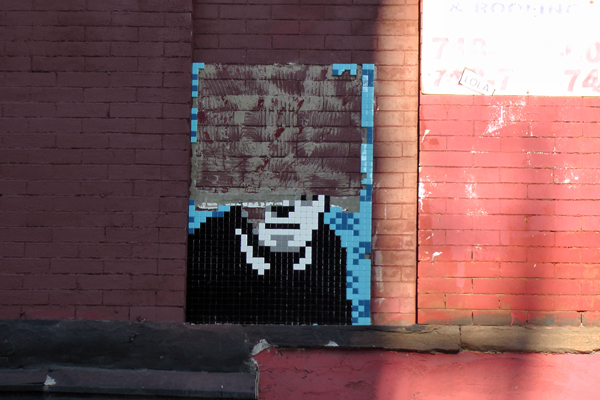 As I wrote in Invader 1, Invader is a world-famous artist, who works exclusively in the medium of small ceramic tiles. Recently, he's been working in New York City, including (naturally!) 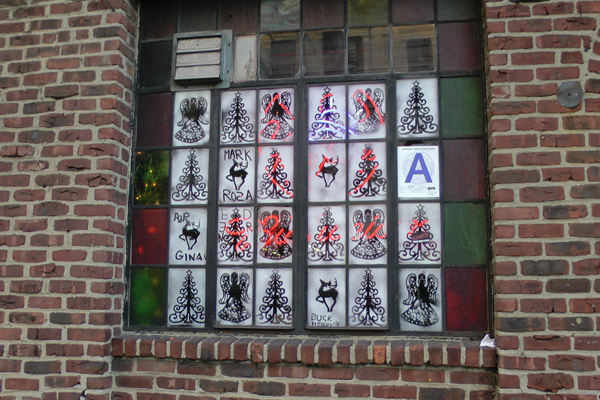 in the East Village! It looks like a whole new mosaic trail is opening up… in the East Village Today! 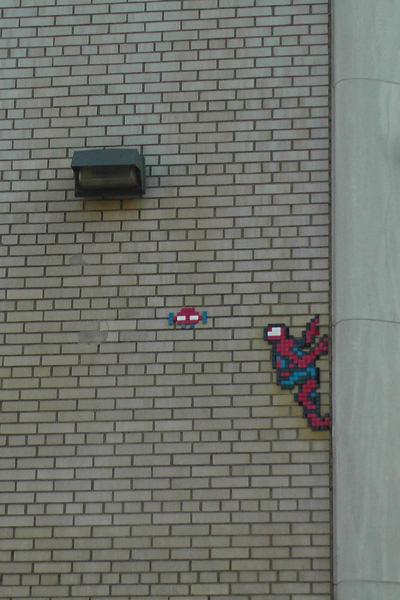 Invader is a world-famous artist, who works exclusively in the medium of small ceramic tiles. Recently, he's been working in New York City, including (naturally!) 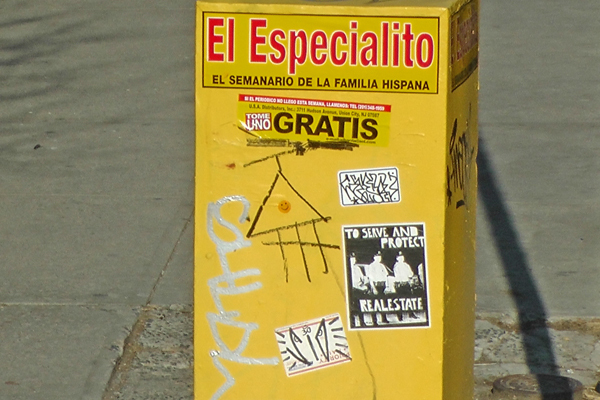 in the East Village! East Villagers love street artists — even more, they love liberating the work of street artists! It's hard to know why the liberator stopped where he did, or why he didn't liberate the edge pieces at the top. 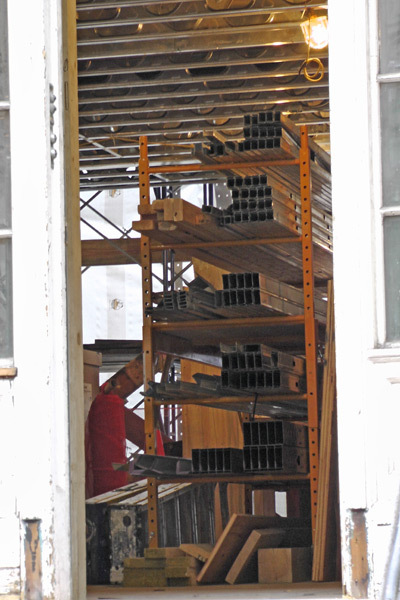 It's also hard to know if he labelled the pieces, so he could reassemble the mosaic at home. 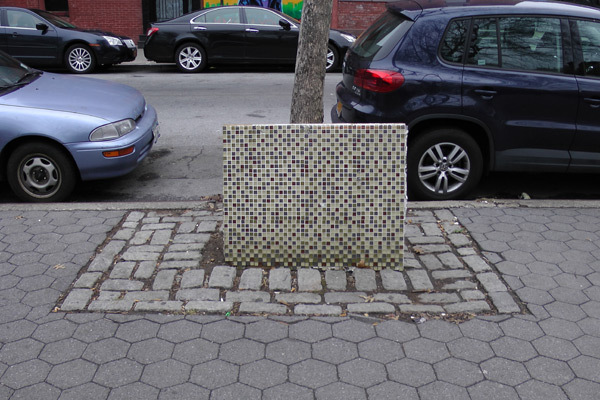 Please Do Not Steal My Mosaic. Thank You! You can't mince words with East Villagers Today! I was walking across East 6th Street, oh, some time around December 6, when I saw the most mysterious flashes I've ever seen outside of the desert! Maybe it's time to call the Ghostbusters! SantaCon, by Currier & Ives. 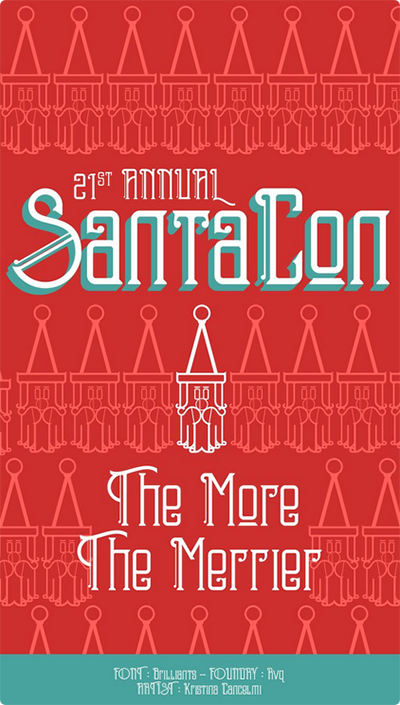 Another SantaCon 2015 has come and gone, and once again it was a rollicking good time, as East Villagers, present and future, came together to celebrate the holidays! I wasn't able to get out during the daylight hours — pictures I've seen show even more Santas than my video captured! 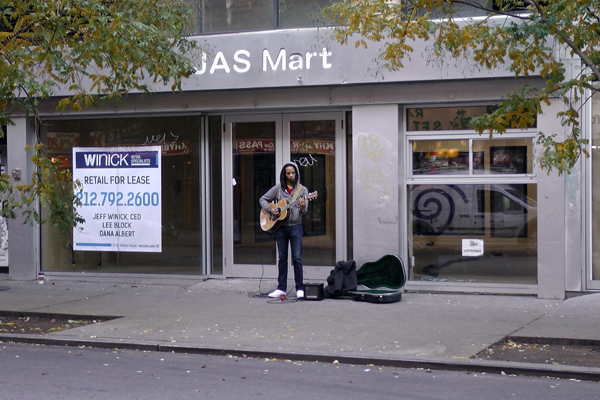 The East Village is famous for its buskers — you can't swing a cat without hitting one! 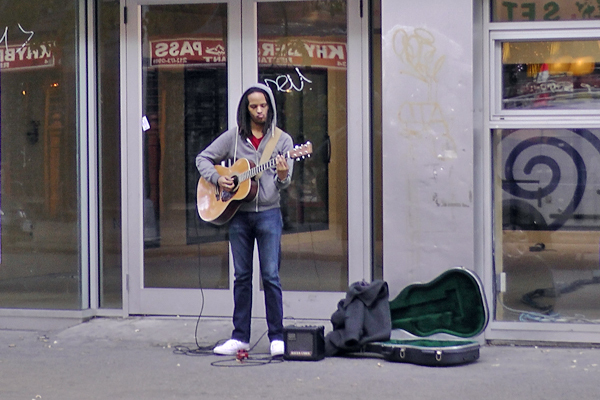 Busker in front of JAS Mart. They say that he won't last too long in the East Village — he'll catch a Greyhound bus for home, they all say. But they're dead wrong, I know they are. 'Cause he can play that there guitar. 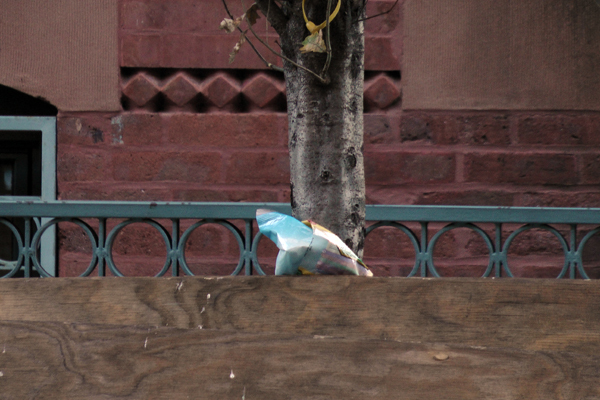 And he won't quit till he's a star… in the East Village Today! East Villagers have long been familiar with walking down the street and finding a lost shoe. "How does someone not know they lost a shoe?!" they can oftentimes be heard exclaiming! This had to be shed deliberately — how does someone not know they lost a thong?! Sometimes, all you need is one item to make a costume, or decorated tree! East Villagers are the kings and queens of understatement! Vazac's is known for their stencils, which are defaced almost immediately by their customers, who write their names or clever slogans in the Ice Crystals Aerosol Spray! They won't be able to deface that "A" rating though! It's comforting to know that the bags of pretzels you can buy at the bar are kept at the right temperature! 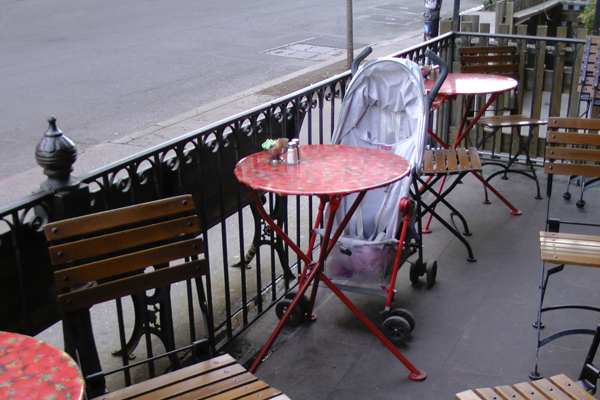 Baby stroller positioned at a table. The beloved Cafe Mogador has always been known for its young clientelle! Table for one year old, please! 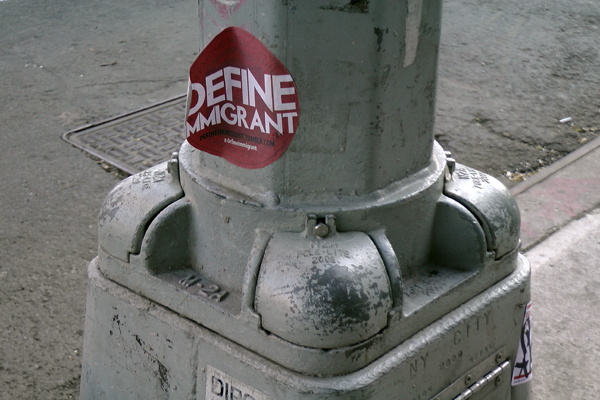 Sticker peeling off a lamp post. Every East Villager is an immigrant, not just from foreign countries like Canada, but foreign states like Ohio, or foreign boroughs like Queens! 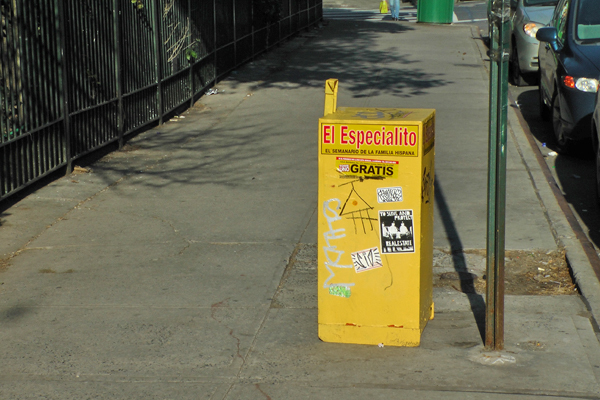 The East Village is the 21st-century melting pot of coolness! 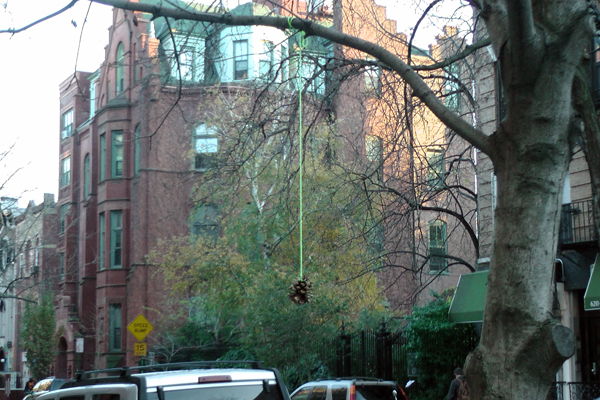 Ask any East Villager what their favorites things are (after the Halloween Dog Parade, of course! 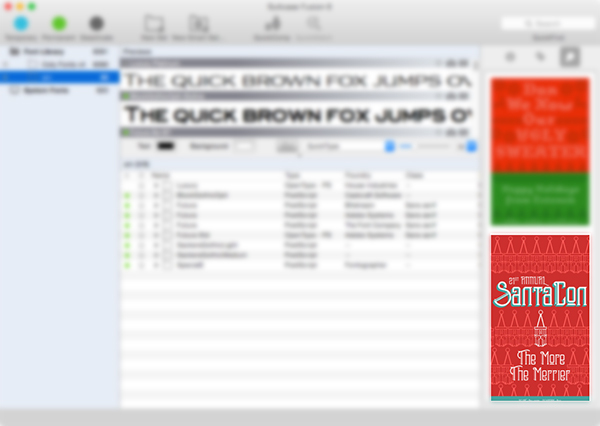 ), and they'll tell you "Beer and Christmas"! If you're burly enough, you can carry them both home at the same time, one in each hand! In the East Village Today! 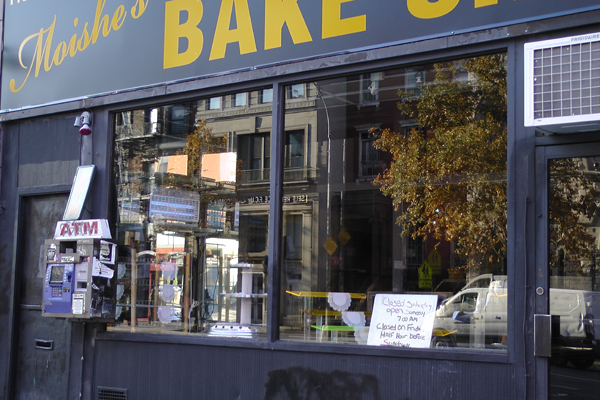 I've written about the beloved Moishe's Bake Shop, on Second Avenue, many times. This is another one of those times! East Villagers love spiffy, clean windows! 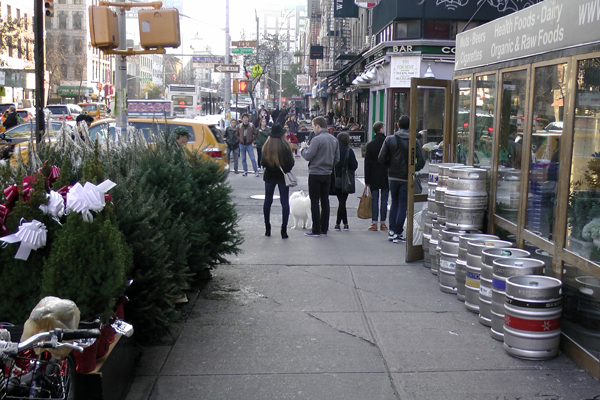 Everywhere you go, SantaCon is in the air… even outside the East Village Today! 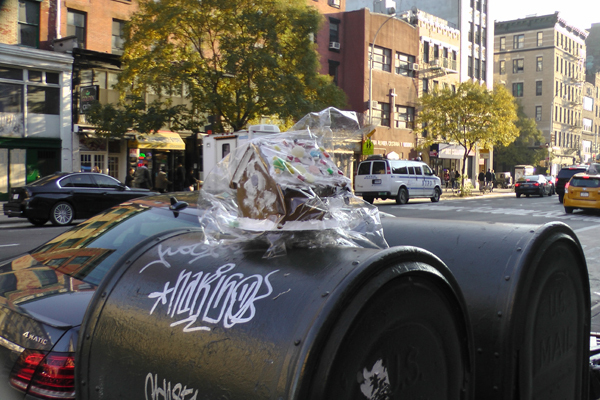 Abandoned, plastic-wrapped gingerbread house on a mailbox. East Villagers are a freegan lot, so I'm sure this didn't stay up here too long before it was eaten! 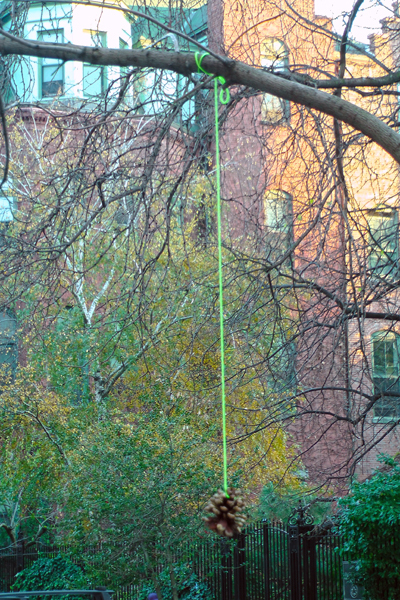 Free the joy… in the East Village Today! 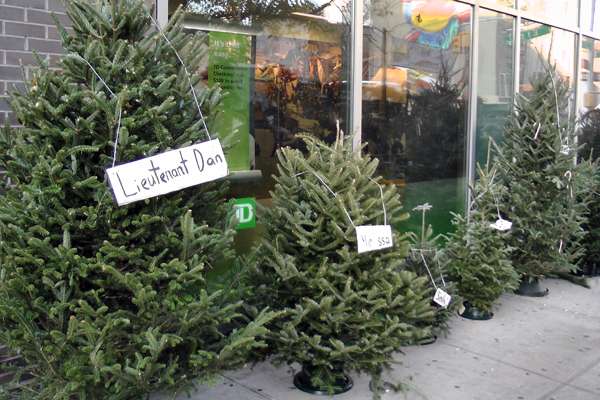 There was a time when the corner of First Avenue and East 1st Street was an eyesore — no one would have thought of selling Christmas trees in front of it! 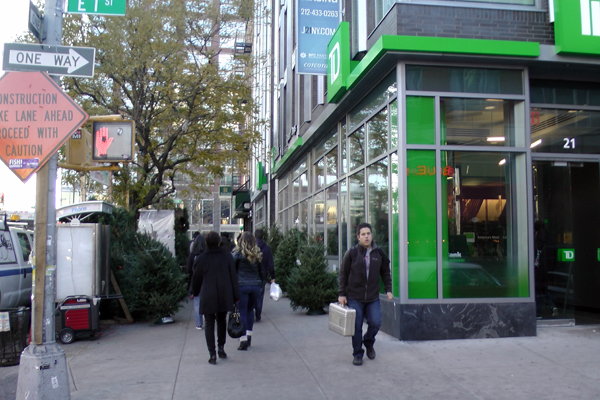 Strolling past the beloved TD Bank. John [sic] Snow, and Gandalf. 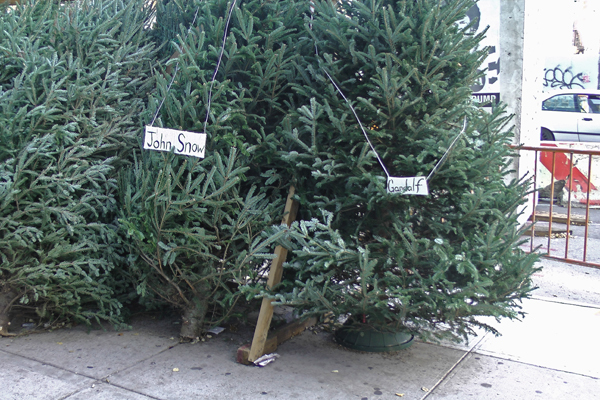 The thing about Christmas trees named after famous celebrities is that you need to leave the sign hanging around it once you get it home, so people will know who it's named after! Guess which tree I bought?! 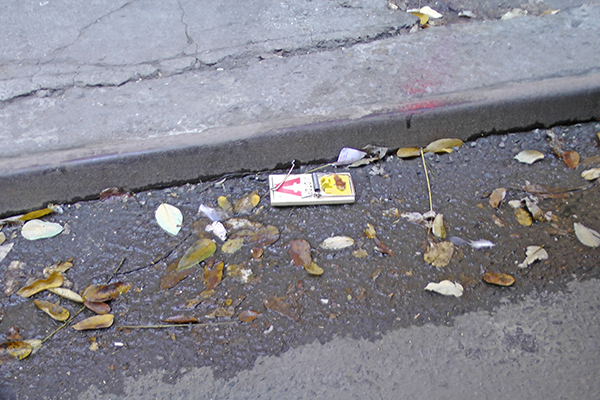 Litter outside Church of God. It's a good thing these boards were abandoned here, or this litter would have fallen onto the ground! Don't Pay the Ransom – I Escaped! 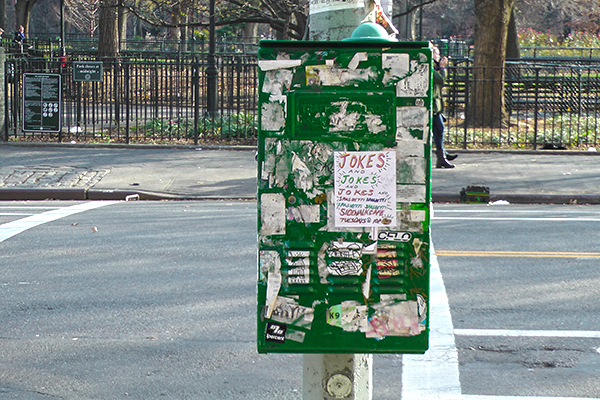 East Villagers have been asking: Where's East Village Today? The truth is, two things happened that resulted in my not being able to take pictures: 1) the end of Daylight Savings Time means that it's dark when I get out of work, and my video camera does not take great pictures at night; and 2) my morning routine has changed — I am no longer able to take pictures on my way to work! A momentary setback, you can be sure — soon enough I'll be back to shooting on weekdays! At least I wasn't kidnapped! 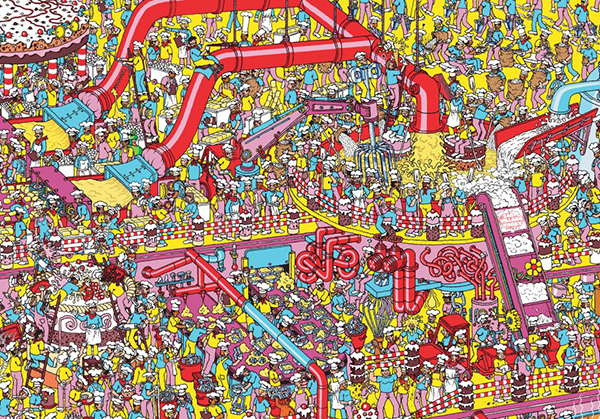 Labels: east village today, where's waldo? East Villagers are beside themselves in anticipation of the event that almost rivals the Halloween Dog Parade: Santa Con! If you want to be a SantaConner (not to be confused with Sarah Connor), you still have time to purchase your Santa costume at such local, beloved boutiques as Party City!